Star Trek, in all its various incarnations, has changed the way we see science fiction on television — not once, but over and over. Not only that, but Trek has made us think about human nature in a new way. No matter which Trek series is your favorite, and no matter where you stand on politics or religion or culture, there are installments of Star Trek that speak to everyone. This series proved that the final frontier is a lot bigger and deeper than anybody knew. Here are the 10 episodes, from throughout Star Trek's history, that are the most timeless and mind-expanding. I was torn between this episode and "Space Seed," the episode that introduced Khan Noonien Singh. They're both great episodes, but "Space Seed" partly gets a lot of its fame from the surpassing brilliance of Star Trek II: The Wrath of Khan. And "Space Seed" is one of a number of "maniacs and fascists try to take over the Enterprise" episodes. In fact, a major pattern in the original Trek is Kirk being faced with another man who challenges his authority: sometimes an actual duplicate Kirk, sometimes just a man who shares some of Kirk's qualities. 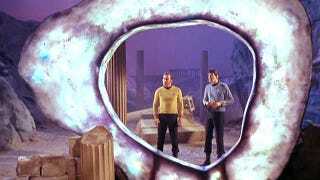 But the alternate-universe episode "Mirror, Mirror" is the only occasion where Kirk is faced with a barbaric version of himself and forced to impersonate his double. As Spock helpfully explains at the end, Kirk is a civilized man masquerading as a barbarian. The episode gets to the heart of two key Trek concerns: leadership and the nature of civilization. Speaking of stories about the nature of civilization... this episode really shows what Voyager was capable of, and what made Voyager a Star Trek series rather than just a generic space opera. Voyager gets trapped into a pocket of space where ships get drawn in, but it's almost impossible to escape. The only way to survive is by preying on the other ships trapped there. The lone Federation ship in the Delta quadrant feels isolated and on a knife-edge, in a way it seldom does in other episodes. The crew loses enough resources to piracy that they seriously contemplate resorting to piracy themselves. Instead, Janeway convinces enough other ships of the benefits of an alliance that everybody is able to benefit, and ultimately escape the Void. This episode is one of the most inspiring and well-realized presentations of Trek's famous optimism. Captain Picard gets zapped by a mysterious space probe that forces him to experience the entire life of a man on a dying planet, as a way for the inhabitants of the now-dead world to live on. There were many episodes of TNG which explored the meaning of existence, and the value of an individual life, in a fairly subtle way — but this was arguably the best. Patrick Stewart is superb as Picard and the man he becomes, Kamin, to the point where his return to life as Picard is actually a bit jarring — and he's no longer quite the man he was at the start of the episode. When Deep Space Nine is remembered, it's usually for a couple things: its gritty wartime drama, and its gutsy depiction of the dark side of Starfleet. And probably the best encapsulation of both themes comes from this episode, in which Benjamin Sisko discovers just how far he's willing to go to convince the Romulans to join the Federation in fighting the Dominion. Like most of the other episodes on this list, it's an excellent character study, showing how Sisko loses his idealism in exchange for a shot at victory. (I also considered including "The Siege of AR-558," which shows the cost of war more literally.) It's also an episode that keeps you on your toes, as Garak's unscrupulous plan unfolds in a surprising way. It's hard to believe an episode about furry little creatures infesting the Enterprise is one of the most beloved Trek stories, which has spawned two sequels and numerous shout-outs — until you actually watch the episode, and then it's easy to see why. It's not just one of the funniest Star Trek episodes, it's also one of the cleverest. Kirk faces two challenges: a Tribble infestation and a Klingon plot to sabotage the Federation's relations with a key planet, and the solution to both problems dovetails in a nice way. Also, this is arguably the best of the "Federation has détente with the Klingons" stories, where Kirk has to play nice with those ruthless bastards. And in that context, Kirk's annoyance with the Tribbles is just a furry, purring symbol of the challenge of pursuing diplomacy with people who want to kill you. Captain Picard gets trapped on a planet with an alien captain who speaks only in allusions to epic sagas and religious texts, and they have to learn to communicate before the planet's ferocious native life form wipes them out. It seems like a fairly extreme way of going about educating someone in your ways, but you have to take some fairly extreme measures when your language is so strange it breaks the Universal Translator. And you have to give this episode major props for serving up a totally foreign culture, one whose entire way of looking at the world is totally at right angles to ours. And the episode's coda suggests that true nobility always lies in seeking a way to understand each other, and mutual understanding is a goal worth sacrificing your life for. The best Star Trek time travel story is also arguably the best Star Trek romance, as Kirk falls in love with a woman who has to die for history to be set right. It's a gutsy move making Kirk's love interest a pacifist on the verge of World War II — a war that was still fresh in people's minds at the time. But if Edith Keeler survives to lead the opposition to the war, then the relative paradise of the Federation will never come to exist in the future. Seldom have the choices on Star Trek been so heartbreaking. And we get to see Spock wear a pimpin' hat. Another beautiful character study — Jake Sisko loses his father in a warp core accident, but the "ghost" of his father keeps following him throughout his life, into old age. Except it's not a ghost, of course — it's a subspace thingy, that's tied to Jake somehow. And Jake basically throws away his life trying to bring his father back, to no avail. It's a great metaphor for what it's like to be so consumed by loss that you can't move forward. And it's a deeply moving episode. Like we said, a lot of the best TNG episodes have to do with communication, and reaching understanding of other cultures — but what happens when you encounter a culture that there is no reaching an understanding with? What if you encounter a civilization that's much more powerful than yours, and has no interest in reaching mutual comprehension? Not only is the result one of the most hair-raising Star Trek stories of all time, with arguably the best cliffhanger ever, but it's also the greatest challenge to the Star Trek vision. In the end, the Enterprise crew wins by taking insane risks — but also by learning to understand the Borg despite the Borg's best efforts to remain mysterious. It's sort of Das Boot on a Starship, but it's also more than that. This episode introduces the Romulans, the Original Series' other big antagonists, and forces Kirk to fight them in a big deep space showdown. Kirk's forced to use every ounce of strategy and ruthless cunning that he possesses, and even then he almost loses. And for the first time, the Enterprise crew sees a Romulan's face and realizes that they look just like their own Mr. Spock — because the Vulcans are basically the more civilized versions of Romulans. While the Enterprise crew struggles with its own xenophobia, we learn that the Romulan captain is an honorable man in his own right. Like a lot of the best Trek stories, this episode forces us to understand the "other," while also showing us the cost of war. Oh, and to fans of Star Trek: Enterprise: I spent ages trying to think of an Enterprise episode that would be good enough to bump one of these others off the list, in the interests of balance and fairness and all that. But after poring over the Enterprise episode guides and reliving the show's best moments, I just couldn't find one particular outing that would stand up to these other 11 hours of television. No disrespect to Archer and crew intended.